Citation Information: J Clin Invest. 2005;115(2):443-450. https://doi.org/10.1172/JCI23084. 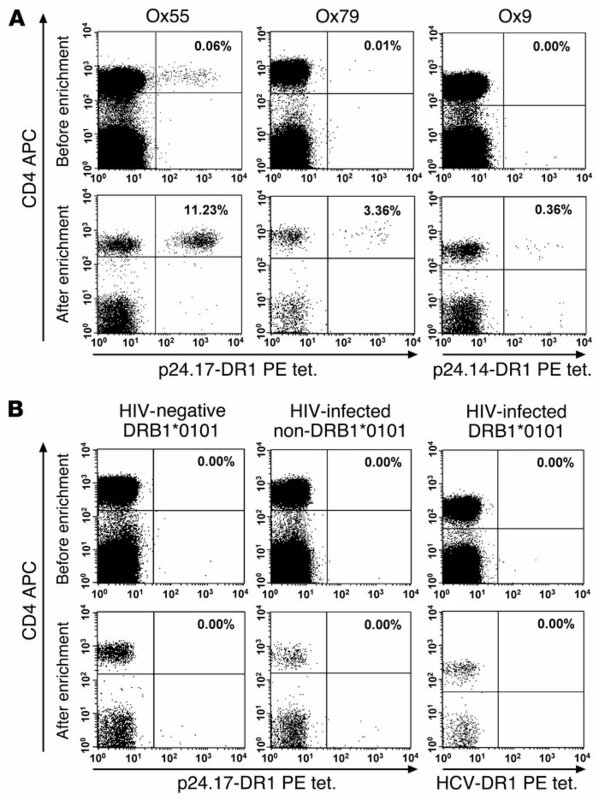 HIV-specific CD4+ T helper lymphocytes are preferred targets for infection. Although complete interruption of combination antiretroviral therapy (ART) can form part of therapeutic manipulations, there is grave concern that the resumption of viral replication might destroy, perhaps irreversibly, these T helper populations. High viremia blocks the proliferation capacity of HIV-specific helper cells. However, cytokine production assays imply that some antigen-specific effector function is retained. Despite this careful work, it remains unclear whether the return of HIV-1 replication physically destroys HIV-1–specific T helper cells in the peripheral blood. Difficulties in producing stable peptide-MHC class II complexes and the very low frequencies of antigen-specific CD4+ T cells have delayed the application of this powerful technique. Here we employ HLA class II tetramers and validate a sensitive, quantitative cell-enrichment technique to detect HIV-1 T helper cells. We studied patients with early-stage HIV infection who were given a short, fixed course of ART as part of a clinical study. We did not find significant deletion of these cells from the peripheral circulation when ART was stopped and unfettered HIV replication returned. The turnover of these virus-specific cells increased and they adopted an effector phenotype when viremia returned. HLA class II tetramer staining of CD4+ T cells. PBMCs were stained directly ex vivo and gated on CD14–, CD19–, and Via-Probe–negative cells. (A) Representative plots showing positive tetramer staining in HIV-infected individuals bearing DRB1*0101 stained with the HIV Gag p24.17-DR1 (panels Ox55 and Ox79 before and after enrichment with magnetic beads) and p24.14-DR1 (Ox9 before and after enrichment) PE-conjugated tetramers (PE tet). (B) Representative staining of control samples. Controls stained with the Gag p24-specific tetramers included HIV-negative individuals bearing DRB1*0101 (left, upper and lower panels) and HIV-infected non-DRB1*0101 individuals (middle, upper and lower panels). HIV-infected individuals bearing DRB1*0101 were stained with a DRB1*0101 control tetramer complexed to an irrelevant HCV peptide (right, upper and lower panels). The percentage of cells falling into the upper-right quadrant is indicated for each panel.